The first thing I did was head over to Michaels and purchase these neat plastic “suitcases”. Inside these suitcases, we would put pictures of “places we had been to” and souvenirs of our trip. The next thing I did was get my children passports! 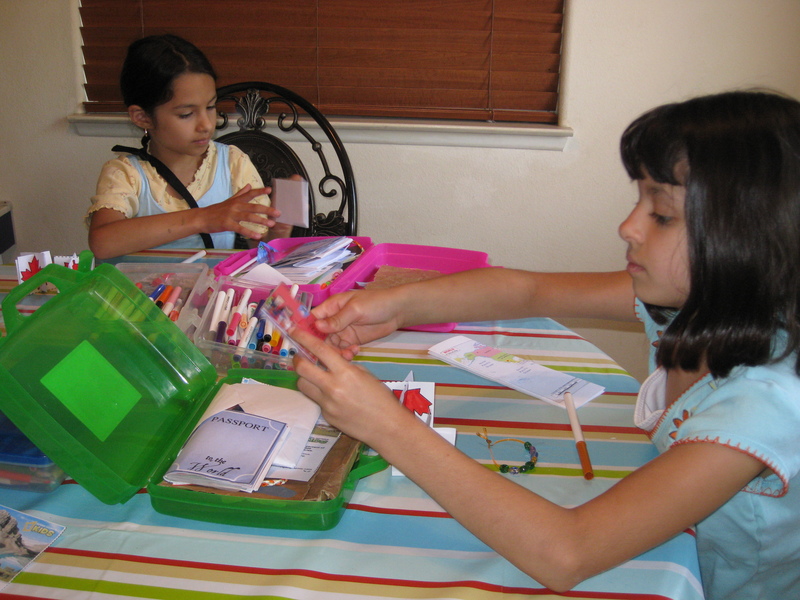 Head over to this wonderful website, My Homeschool Treasure Trove, and print off Passports. You will be hard-pressed to find better. I also will try and find neat stamps to use as well. 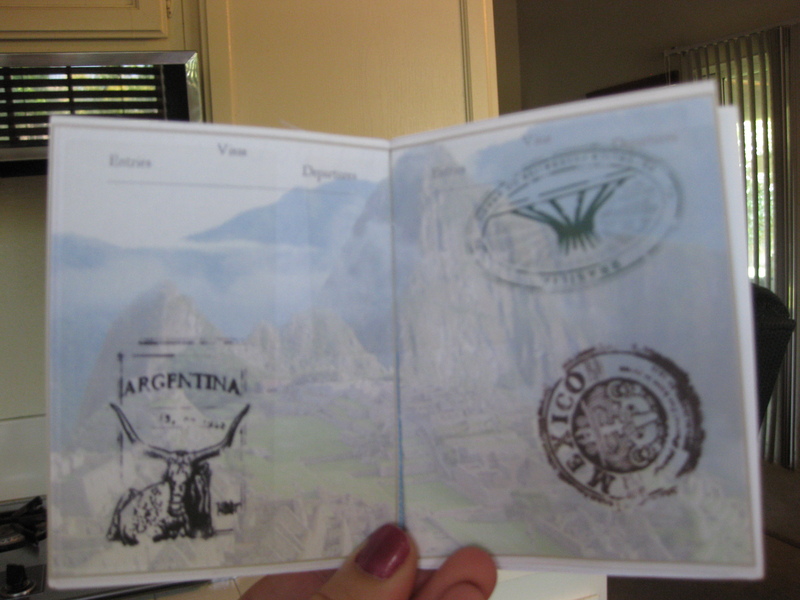 My kiddos get a stamp in their passports for each country we visit. Pretty neat! I then chose which countries I wanted to visit. There are so many countries to choose from; where would we start? I decided to start with countries that had particular meaning to my children and then go from there. There are twelve weeks in our summer, but we only do summer school for ten; so, ten countries were chosen for our fun. Each summer (we have been doing this for three years now) we choose completely new countries and we start all over again. Next, I headed over to National Geographic Kids. There, I found we were able to watch videos, listen to music, and many more things relating to the countries on our list. While I was there, I also noticed that each country had a picture you could download and keep. I promptly printed one for each of our countries and made sure each of my kids had a copy. Hooray! Nothing like some photos to remember our “trip”. To make the adventure more fun, I made sure to add a craft. Each country has some form of art particular to them. It was great fun researching each project. For some help on this, as searching Google could take years, try DLTK. Their ideas are very helpful and pretty extensive. To top it off, let’s add some food. There is nothing like visiting another country and trying the local fare. A quick Google search gave me some great recipes from each of our countries. I try to pick something simple (the idea is to have fun, not stress out) and different. Now that I have my items prepped, we are ready to go! On the first day of geography, each of my kids were handed their “suitcases”, passports, and a small map of the world. Our maps marked with our destination, we then headed over to the computer where we delved into our country of the week, with the help of National Geo. We read about the country, we watched a video or two, we listened to music, and tried steps for a traditional dance. We then headed to the kitchen table and worked on our craft. Once they were done and our “souvenirs” added to our suitcases, we headed into the kitchen to make a local delicacy. Yummy! Finishing off our trip, we stamped our passport books and packed away our suitcases for another day. Tired and spent from a full morning of “travel”, we are now ready to kick up our feet and rest. Mmmm… I wonder where next week will take us! This entry was posted in Books, Curriculum, & Resources, Homeschooling and tagged children, countries, curriculum, geography, homeschool, lessons, map, national geographic, organization, passport, summer school, teaching, travel by thehomeschoolmomblog. Bookmark the permalink. Ten more countries have just been chosen. Let’s see where our “Summer of Fun” takes us this year! Thanks; we like it too! Such a great idea! Geography is so important, and so often neglected. What a fun thing to do as a family! This sounds like an awesome summer project! Can’t wait to get started! I think I’ll add a Flat Stanley to the mix… from the book. You take a laminated flat paper doll and find someone in another country who will host your “Flat Stanley” and journal his adventures – the same ones th host family embarks on. You can host theirs at the same time! I have a cousin in Australia, and another who does the Hollywood scene… I’ll have to contact them and others…so excited! We are going to be doing a Flat Stanley project for our county fair. How exciting! Are you familiar with Wee Bee Tunes?? No, I’ve never heard of them. I will look them up now though. Thanks for the suggestion! When we study geography, we always make a popular dish from the countries we “visit”. My kids have always loved geography, too. There is always a way to make any subject fun…you just have to use your imagination! By all means; please do! The more who can enjoy this idea, the better. Hello 🙂 I re-blogged your post this morning. Thank you! How fun! We did something similar last year, but not this organized. U love how you mixed creativity with organization, and I really love the summer idea! An excellent idea to make learning and summer a wonderful experience! I can see why your kids love geography so much! What fun ideas! Thank you so much for sharing. I was just planning to start my boy with Geography as we were reading the Flat Stanley books and he was really interested in learning about the countries that are featured in the books. Will definitely add your ideas to our lesson plans. great idea. I wish they had that kind of cool things when I was a kid (pre-internet days). Do you ever hear your kids say “I’m bored” during summer break? Take this mom’s advice and break the boredom cycle before it begins with a Passport to FUN!!! I learned really quick not to let my mom know I’m bored 🙂 Mom always had some kind of project to give me! But they were pretty fun, like this one! I love this idea. For the first summer ever I’m doing Summer Bridge learning. I’m nervous but excited. I think I’m going to use this idea and tweak it to fit my little ones! Thanks for the great idea! Best wishes. You’ll have lots of fun! Hi there! Love the post. Tried the link you gave to the passports (My Homeschool Treasure Trove) and it doesn’t seem to work anymore. Any suggestions? Looking up “My Homeschool Treasure Trove” was unfruitful. Do you have the web address by chance? Please email it to me if you do. Thanks and happy summer learning! While THIS isn’t the link I originally used, this one works very well. Hopefully it will help?